Debut a hot new look and play with geometric patterns this autumn. 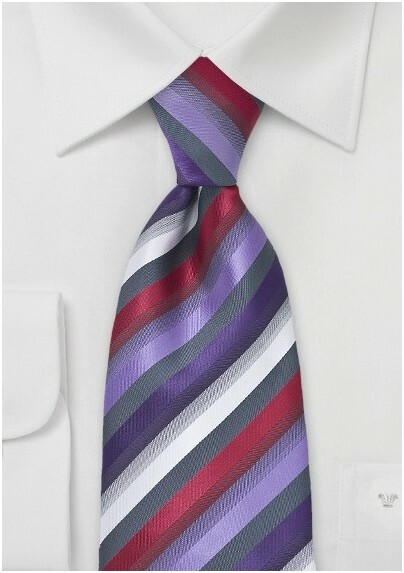 This asymmetrically striped tie in a chic colorway of greys, purples and reds is a sure fire way to update your collection of suits and dress shirts. To add a fashionable edge to your favorite suits, we suggest pairing them with a micro-check dress shirt and striped ties in innovative colors. 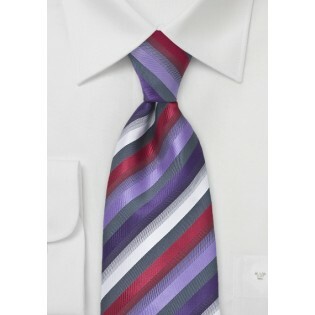 Team this tie with a grey suit and a purple pocket square for a modern and hip look. Designed by Puccini and constructed from a high quality micro-fiber.